GALION — The evening sky over Galion was filled recently with glowing holiday memories and warm prayers for a new — if different — kind of Christmas season. On the evening of Nov. 29, nearly a hundred Galion area residents gathered in the Snyder Funeral Home Richardson Davis Chapel on Market Street for a Celebration of Remembrance. The evening was held not only to remember those who have passed this year, but also to prepare for a holiday season that will be remarkably different for many due to the death of a loved one. Each candle represented a way to cope with the loss of a loved one. Each candle signified one of the following: Emotions, Courage, Memory, Love, and Hope. The service also included the readings of the poems “My First Christmas in Heaven” and “Different Kind of Christmas”. Guests were given daily suggestions of steps to go through to assist them in dealing with day-to-day grief. Define boundaries, minimize stress, and to give yourself permission to cry were a few of the ideas mentioned. Amy Miley sang “The Christmas Song” and “Christmas Lullaby” during the service. The evening included special music, a candle lighting ceremony, and a meditation on the importance of memories by Pastor Joe Stafford. The Christmas season presents unique challenges for people in grief, and the program presented options to develop new traditions for families, as well as a December calendar full of suggestions to ensure that this holiday time — though different — can still be enjoyable. The highlight of the evening was when all those in attendance helped launch dozens of southwest, over the city of Galion. They remained visible for miles. About 75 lanterns were remained visible for miles, sending their prayers and messages up to their loved ones in heaven. The staff of Snyder Funeral Home Richardson Davis Chapel was available to help reassure families that their Christmas season will be blessed. Guest were sent home with the gift of a sky lantern, in order to launch one again with family during Christmas week. Snyder Funeral Home Richardson Davis Chapel is located on South Market Street, and is Galion’s full service professional funeral home with it’s own cremation operations, full-time cremation specialists, media department, aftercare and dedicated Pre-Planning specialists. The annual Celebration of Remembrance is indicative of their dedication to their investment in the Galion community. Courtesy photo A ‘Celebration of Remembrance’ was celebrated last month at Snyder Funeral Home Richardson Davis Chapel in Galion. The evening included a release of Chinese lanterns that were visible in the night sky for miles. Families who attended the event also were given a Chinese lantern to release at their own home during the holiday season. https://www.galioninquirer.com/wp-content/uploads/sites/38/2017/12/web1_Lantern-1.jpgCourtesy photo A ‘Celebration of Remembrance’ was celebrated last month at Snyder Funeral Home Richardson Davis Chapel in Galion. The evening included a release of Chinese lanterns that were visible in the night sky for miles. 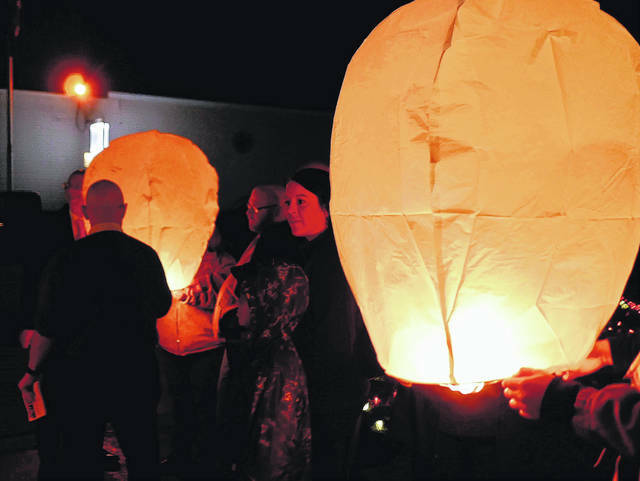 Families who attended the event also were given a Chinese lantern to release at their own home during the holiday season.